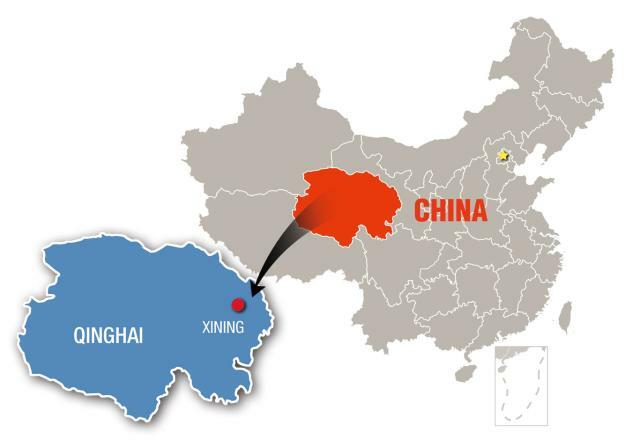 Practicalities Xining is on major flight and high-speed rail routes to major cities on points west and east. Late night flights were very cheap, so look out for bargains. You can take the train to Lhasa, but not on a whim – foreigners need permits to enter Tibet proper. Buses are reasonable and cheap to get to smaller destinations. Only a few budget accommodation options can accept foreigners, so you need to check that out. Otherwise, there are the usual chains and a few high-end options like the Sofitel, if you want a treat. Apparently for most people, the main point of coming to Xining, capital of Qinghai Province, is to leave it – most of the sights that are marketed are well away from the city. Yet the city itself is pleasant and there are a few things that are worth your time. I arrived on a bus from neighboring Gansu Province, a stunning journey over high mountain passes and through already snow-covered grasslands, even in early October. The other passengers were mainly Tibetan, and as I was lucky enough to nab a front-row seat, from behind, every time we negotiated a particularly hair-raising bend or slope, the chorus of prayers would rise, falling when we got on the flat. Some prayed all the way. The trip was enlivened by a bathroom stop in a scenic spot just before the town of Tongren, known as Rebkong in Tibetan, where the driver suggested that if I needed to use the facilities, the field of flowers on the left of the bus was reserved for ladies. Rebkong could make a nice stop on the way to Xining (or an easy day trip) – it has several Tibetan temples and the Rongwo Monastery, but it is mostly famous for being a center of excellence for the art of thangka painting – religious paintings that are found in Tibetan places of worship and homes. Arriving in Xining, the bus station is next to the gleaming new high-speed rail terminal – yet another example of an unfeasibly large station that means a very long walk to get any kind of connecting transportation. It’s almost quicker to ride the train from Lanzhou (just an hour). The city is long – encased in a valley on the edge of the Tibet-Qinghai Plateau, it sits in a prime geographical location on the main trade route from northern China to Tibet, highways now replacing the trails of the past. The city has obviously undergone extensive modernization in the last few years, so there are few actual sights in downtown, although there are some nice neighborhoods to walk around in. These host some welcoming cafes and restaurants, many of which serve food from the melting pot of ethnic minorities that live there, or pass through on their way to the roof of the world, to China’s tropical south or to its dry western desert regions. Feeling momentarily virtuous, I decided to go low budget and stay in backpacker hostel, located on the top floor of a regular apartment block. But the hostel I stayed at was in a nice neighborhood – although it was freezing, and mostly empty. Xining gets winter heating earlier than other parts of China, but even in early October, it was still pretty chilly at night. Not that it bothered the locals – going out later for a bowl of quite delicious vegetarian noodles at a local Muslim joint, the doors were wide open, allowing the bracing night air to enter. 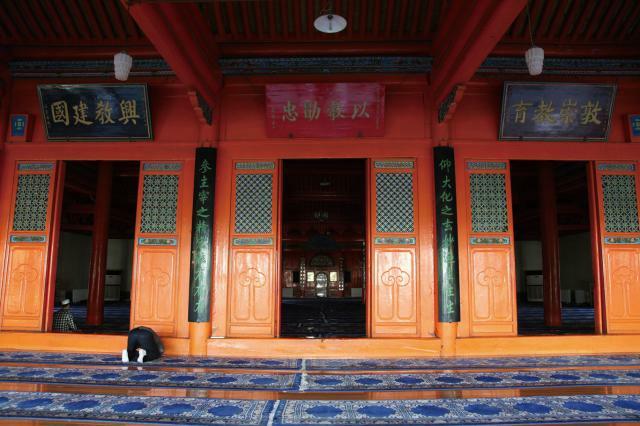 For a more in-depth look at local Muslim life, head to the Dongguan Mosque in the old downtown. Just before dusk is a good time to go as the area gets busy with people heading for the last prayer of the day. It looks pretty modern now, and as night falls, it starts to look like Aladdin’s palace, but there has been a mosque on the site since 1380. 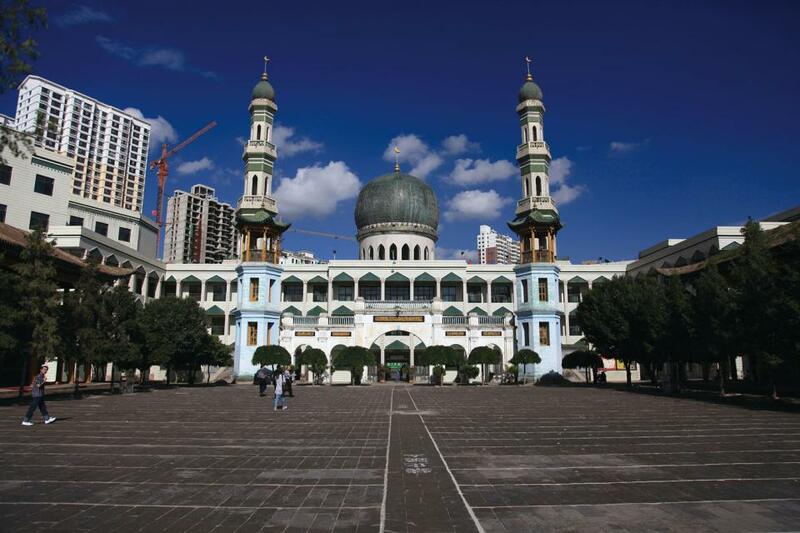 You won’t be allowed in the main prayer hall – this is standard with mosques in China, but you can walk around with a guide who will point out the different features of this blend of Chinese and Islamic architecture, that was last renovated in 1979. Around the mosque there are still a few old streets with many small stores and restaurants, obviously gearing up to serve food to hungry worshippers after the prayer service. Some are not for the faint-hearted – various parts of lambs or chickens – but there are stalls with tempting displays of different types of naan and other bread, or nuts and fruit. Despite the notices around describing in quite some detail about what sort of clothing would and wouldn’t be tolerated – “Women in low-cut dresses, shorts and skirts are not allowed” during certain times, or they would have to cover up. Luckily, I was not wearing such garments, and I was beckoned in by a friendly imam. It’s free to enter, and you can just wander around. Some small children were eager to chat and practice their English after school – their parents were busy working in the nearby restaurants. The other main sight in Xining is Ta’er Si, or Kumbum Monastery. Not in the city proper, it’s about a half hour car ride if traffic is good. Car hailing services will take you, or you can bargain with local taxi drivers. Some tour operators include a visit to Kumbum as part a tour to other parts of the province. There has been a Tibetan monastery there since 1583, although there has been much restoration and rebuilding over the centuries, and it is still ongoing. It marks the birthplace of Tsongkhapa, who was born in 1387 and became a famous religious philosopher. Formerly home to thousands of monks, now there are only a few hundred. It’s firmly on the route of Chinese tour groups, so at times you may have to battle the crowds. The entrance ticket needs to be scanned further at the entrance of many of the buildings, and guards keep a watchful eye to ensure that the tourists don’t interrupt the daily routine of the monks. There are four colleges at Kumbum, and the most important is the Debate College or Faculty for Logic. Tourists are not allowed to enter, but as you approach, you can hear strange clapping and slapping noises, and the rise and fall of voices. You can watch what’s going on from a couple of viewpoints as the monks engage in what is actually quite vigorous debate. A line of monks sits on the ground, and facing them, other monks stamp their feet and clap their hands as they make their points rather forcefully. At times, the noise sounds like whips are being cracked, although there was no actual contact. The debating, which happens in the afternoon, is undoubtedly the highlight of a visit to Kumbum, although there are many other small temples and museums to visit. But perhaps the most interesting encounter I had was with a couple of monks in a Starbucks in the shiny new part of the provincial capital. Treating myself to a night in the Sofitel (the hard beds of budget hotels had worn me down), I was surprised to find myself in the middle of shopping malls and art centers. Passing up the Harry Potter theme restaurant (I forgot my wand), I went for a coffee, and was beckoned over by a monk who wanted to chat about his work. Primarily, his task was to drag the monks into the modern age by finding new business opportunities. But, he sighed, it was a hard task, and none of them could ever be completely satisfied. If it was so hard for people who give themselves over to religious contemplation, then what hope was there for the rest of us, I wondered.